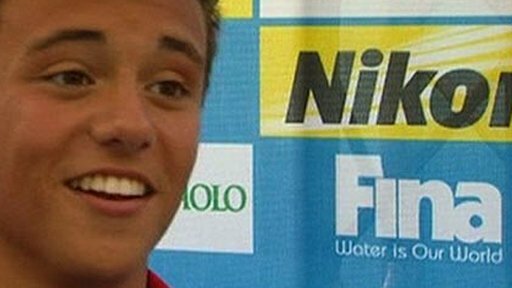 British teenager Tom Daley produced a stunning final dive to win a shock gold at his first World Championships. The 15-year-old was lying third in the 10m platform final heading into the sixth round, but scored 100.30 with his final effort as his rivals faltered. Pre-event favourite Qiu Bo was second, with Olympic gold medallist Matt Mitcham back in fourth. Daley, seventh in the 2008 Olympic final, becomes Britain's first individual diving world champion. Pete Waterfield and Leon Taylor were Britain's last world medallists in 2005. "I really can't believe it," the teenager told BBC Sport. "I was going into the competition thinking 'just go in there, do what you can and give your best performance' and to come away with a gold medal is not even thinkable. "It hasn't sunk in. I was hanging on for fourth place, let alone the gold medal. I can't believe it." Daley, who has targeted gold at the 2012 Olympics in London, was considered only an outside hope for a medal heading into the final. The 15-year-old's lack of experience means his repertoire of dives is less complicated and has a lower points tariff than his rivals'. "I really didn't think I would get anywhere near the medals," he admitted later. "So to win gold, it's just unthinkable, especially when I have the lowest degree of difficulty of everybody there, it's crazy." Daley kept in touch with Chinese pair Qiu and Zhou Luxin as well as Australian Mitcham with his first four dives. His fifth dive moved him up to third but Zhou - a silver medallist in Beijing - set a high standard in the final round by scoring 100.70. Daley, following Zhou, nailed his final effort, receiving three perfect 10s and three 9.5s for a 100.30. That put his total at 539.85, just 15.05 points short of his personal best. He then watched Mitcham make a complete mess of his sixth dive, before Qiu - who beat Daley at the World Junior Championships last year - made a mistake with his entry into the water. As Qiu's score of 79.80 flashed up on the screen, a disbelieving Daley was left to celebrate winning World Championship gold at the first attempt. His father Rob, who arranged for Tom to move schools recently after his son was the victim of bullying, was overwhelmed. "It was a brilliant feeling when he was fourth," he said. "Then when he got bronze it was amazing. When he got silver I thought 'don't let it stop'. "Then waiting for the last score when the Chinese man dived seemed like an eternity. "I had a flashback of his life and I looked up and thought he's a world champion and he's 15. The Plymouth diver has a chance to win a second medal in Saturday's synchronised event, when he partners Max Brick.